Rift Valley Region’s St. Anthony’s Boys Kitale had a brilliant start to the Kenya Secondary School Sports Association Term 2B national finals winning in both the Under-16 Copa Cocacola and Under-19 categories on the opening day of the championship in Eldoret. 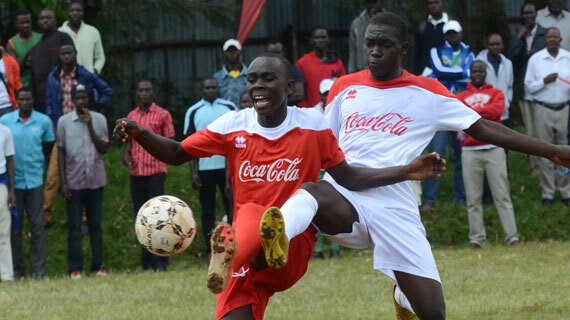 The senior team won 4-0 against Nyanza’s Ringa Boys while the juniors playing in the Copa Cocacola were 2-1 winners over Central region’s Olbolosat in a pulsating game at the Hill School in Eldoret on Tuesday evening. Coached by former Tusker and Bandari deputy coach George Owoko, the Solidarity Boys showed class in both matches. “Winning the first game is always very important and I am happy we had to start well. We played good football and my aim is to take both titles. We will go a step at a time,” Owoko told Michezoafrika after seeing his Under-16 side win their opening game. The victory never came easy though as they had to battle from a goal down. Boya Rashid Adam opened the scoring for the Central region team with a neat finish after some goalkeeping blunder early in the game. But the hard fighting St Anthonys drew level 20 minutes later with Issa Rashid’s thumping header from the edge of the six yard box drawing parity. At the stroke of halftime, Daniel Odhiambo saw his side go 2-1 up with a neat finish after controlling the ball beautifully inside the box before slotting past the keeper. Earlier on, the seniors were in a class of their own, hitting four unanswered goals past Ringa in a match that was heavily watched, some calling it the mini ‘Mashemeji Derby’. Coming just a day after the real Mashemeji Derby ended 2-1 in favor of Gor, St Anthony’s had a small revenge for their big brothers. They broke the deadlock after 12 minutes when Eli Sakenyi’s shot from distance slipped through the keeper’s fingers and into the net. In the second half, the Solidarity boys pumped up the tempo and Sekanyi doubled his tally with a 66th minute goal. Owoko’s boys finished off the job in the final 15 minutes of the game, James Kibendi stepping off the bench to score a late brace. In the other Group A match, former champions Kakamega High used their experience playing in the National Super League to come from a goal down and beat last year’s semi finalists Kathungi from Eastern 4-1. Kathungi broke the deadlock in the 15th minute through Rashid Abdulrahman before Kevinton Machika restored parity in the 23rd minute. Hull City trainee Joshua Otieno’s thumping shot in the 21st minute made it 2-1 for Green Commandos before Machika completed his brace late on in the first half. Dan Oloo put the icing on the cake with a late fourth. In other results of matches played, Riyabu from Nyanza beat St. Cyprian from Eastern 2-0 courtesy of goals from Evans Onsarigo’s thumping freekick and Solomon Ondari’s header 15 minutes later. Western’s St Peters Mumias beat North Eastern’s Subunly 5-1 with four second half goals seeing them shake off an early scare. Feisal Ali opened the scoring from the penalty spot before Kevin Haggai scored the equalizer and went on to bang two more while Jack Oloo and Ben Stanley added a goal each. Nairobi’s Upper Hill played to a 0-0 draw with Coast’s Kinondoni in the other match. In the Girls’ category, Alliance were beaten 3-0 by Sega while defending champions Olympic from Nairobi were handed a 5-0 thumping by Wiyeta who they beat for last year’s title. Wiyeta continued their dominance even in the Under-19 category beating Matuu Girls 11-0. In another match, Bishop Njenga beat Kwale Girls 3-1whiel Nyanza’s Kobalo beat 4-0 while Olympic also lost in the Under-19 category going down 2-1 to Itigo Girls.